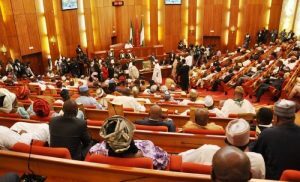 The Nigerian Senate could not garner the required number of senators to hold a plenary on Tuesday. Consequent upon the inability to form a quorum, the lawmakers adjourned the plenary for a week. 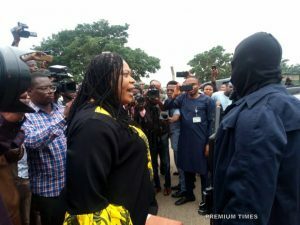 The lawmakers had converged to start the business of the day when Philip Aduda (FCT-PDP) called the attention of his colleagues to the scantiness of the chamber. He ascribed absence of some lawmakers to oversight functions which they are currently engaged in. “We are less than 10, Mr President,” he said. “I want to move that since we have not (formed) quorum, we may therefore adjourn but in doing so I want to say that the senate is empty because various committees are carrying out oversight duties, they are all over the country, ensuring that the budget is performing. The motion for adjournment was seconded by the deputy senate president, Ike Ekweremadu, who said the lawmakers present were more than the figure Mr Aduda quoted. “I rise to second the motion ably moved by senator Aduda but let me add that we are more than 10 but certainly not up to 38. We are somewhere between 15 and 20. Just for the record we are not less than 10 but less than 20,” Mr Ekweremadu said. The motion was unanimously adopted through a voice vote. Senate President, Bukola Saraki, urged his colleagues to conclude their over sight functions and resume on Tuesday November 20. Meanwhile, PREMIUM TIMES can report that the senators have in the past held plenaries without a quorum. An investigation published by this newspaper December 2017 showed that for many days, plenary started with far lower number of lawmakers than 36. A total of 18, 33 and 15 senators were present at the chamber on October 24, October 25 and October 26 respectively based on a count conducted after the Senate President had said the prayer. The investigation revealed that for most of the days in the three weeks a time record was kept, the lawmakers started plenary without forming a quorum.